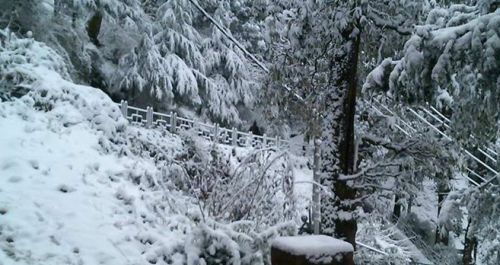 Shimla: The queen of hills, Shimla has received a first snowfall of the session. 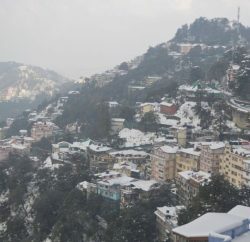 Most part of the Shimla city including Jakhu, Ridge Maidan, Summerhill, Sanjauli, Dhalli have received mild snowfall, whereas Khalini, New Shimla, Panthaghatti and Tutikandi have been lashed with intermittent rain from past 12 hours. 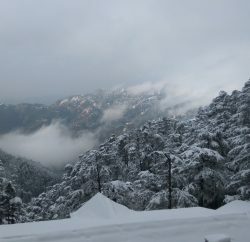 Nearby tourist spot, Kufri, Narkanda, Naldehra, Hatu Peak, Khadapathar and baggi have also experienced fresh snowfall. Vehicular movement on Shimla Theog, Rohru, Rampur via Narkanda, and Chopal has come to a halt. From the past 12 hours biting cold wave has swept most parts of the state and fresh snowfall on higher riches of the Himalayas has dropped the temperature. 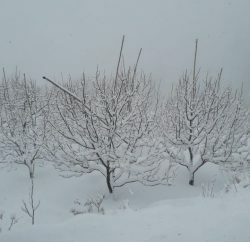 Keylong and Kalpa in tribal districts of Lahaul and Spiti and Kalpa recorded minimum temperatures at minus 8.2 and minus 5.0 degree; Manali and Bhuntar recorded a low of minus 2.4 degree and 0.5 degree, followed by Solan and Sundernagar 1.0 degree, Shimla and Hamirpur 1.4 degree C.
The local MeT office has predicted more snow and rains during next 48 hours.